To start, you probably are wondering, "What is an IFG?" An IFG is a small "book" put together that contains a lot of information that is useful for flying. Normally included is both planning/ground information as well as operational information like course rules, frequencies, and emergencies procedures used during flight. Sometimes you may hear it called the "Blue Brains." This stems from when aviators made up informational pages/gouge (keeping all the really important information used in flight written down on pages) and placed them in the checklist protector pages you were given at check-in. These protector pages had a blue front and back with all the critical information kept between them...so they were referred to as "Blue Brains." These IFG or Blue Brains were nice little places to keep the important tips, tricks, and gouge to get you by on each flight should you forget something. As time went on and they took a more formal road, lots of information was added to them by each person in charge of producing it. Soon they were page upon page of information...very good information but maybe too much information to be useful as a quick reference guide in flight. That point is where this section comes into play to offer up a possible solution to aid in your everyday flights. There are two explanation areas below. One gives a description of the various sections of the issued TW-5 IFG so you are generally aware of its organization. You should take the time to look thoroughly through the pages so you are aware of all the information that is included in it. You are required to fly with it in the cockpit. Notice it is not mandatory that you "wear" it on your leg...that is where the second section comes in to play. The other section explains why a "small IFG" is posted here, what it offers you, and how you use it (should you chose to) to help you during your flights. The TW-5 IFG was issued to you upon check-in to primary. It contains a large volume of very useful information in it. It is standardized across all of the squadrons and the Fixed-Wing Instructor Training Unit (FITU). You can think of it as containing the contract by which all TW-5 aircraft will operate. Information contained within was pulled from the Fixed-Wing Operating Procedures (FWOP), NATOPS General Flight and Operating Instructions (OPNAV 3710), and Airman's Information Manual (AIM) to name a few sources. The sections have various colors to help differentiate them and make it quicker to flip to a given section. The first white section is the opening section. It has a Summary of Changes page where you will annotate any write-in changes or updates. It also has Table of Contents page. The most important page in this section is the communications grid or "Comm Card." 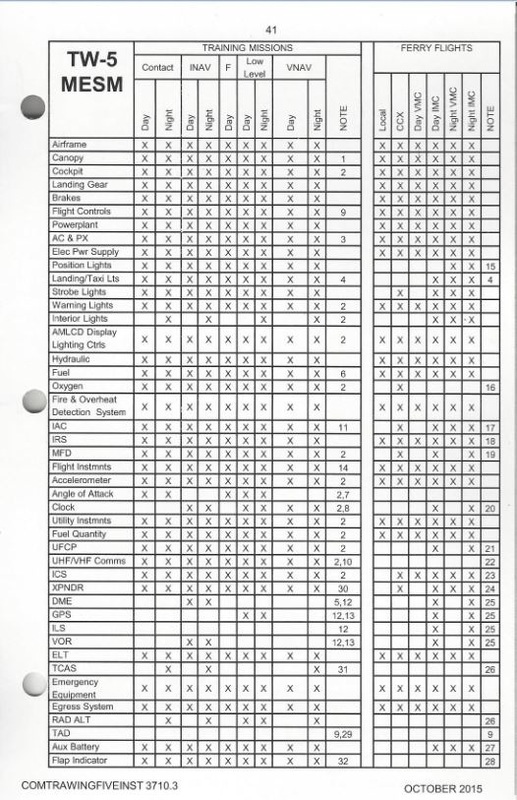 This page lists all of the pre-set frequencies for the radios (UHF/VHF) and VHF navigation. You will notice that departing KNSE is organized to be: Ch 1 (ATIS), Ch 2 (Clearance Delivery), Ch 3 (Ground), Ch 4 (Tower), & Ch 6 (Departure). The grey section contains all of the stereo flight plans. These are pre-determined or "canned" routes that you can use to file a flight plan quickly with base ops instead of a full DD175 Military Flight Plan. The list is organized by the airfield to which the route serves. 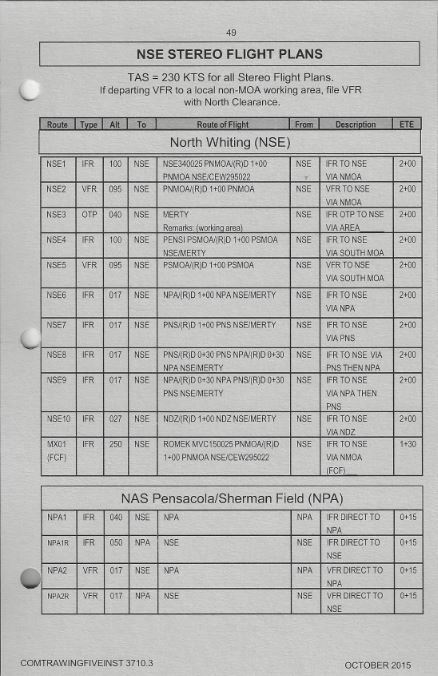 For example: NSE1 is an IFR flight plan from KNSE to the NMOA and back & an NPA1 is an IFR flight plan direct to NAS Sherman. The final pink section contains all the emergency information. This reduced IFG was created with past practices in mind. It was intended to take the plethora of pages in the official IFG and strip it down to something you could wear on your leg for quick-glance references. Using the given IFG became somewhat cumbersome as the pages grew more and more. Furthermore, the various sections have the needed reference information scattered throughout: one section has MOA big-picture & ops, while another has the radio frequencies, & yet another has course rules home. This is not intended to say that the official IFG information is not important or good to have with you...it is...but somehow it lost the ease of reference for information (especially while flying). Thus, a smaller, more organized IFG was created with minimal page turning needed. Where did the official IFG go if this one was used? Into the pubs compartment on the side with the PCL. It is still there if you need deeper referencing. The section below goes through to describe some of the pages in this version. Use what you want or feel you need. You can print it out, place the various pages in the checklist page protectors, and three-ring it to your kneeboard. If you look in the cockpit setup section, the pictures show this IFG incorporated with the kneeboard, pen, and writing area. This page displays the working areas to the North. It uses what's called a stick-diagram to show the NMOA/Pelican/Fox areas and naming convention. The stick-diagram is a powerful situational awareness tool to help you during your operations in the NMOA. This grid matches the overlay you will see on your Tactical Situational Display (TSD) in the cockpit each flight. Within the NMOA grid, it shows the relative position of OLFs and emergency airfields with frequencies. 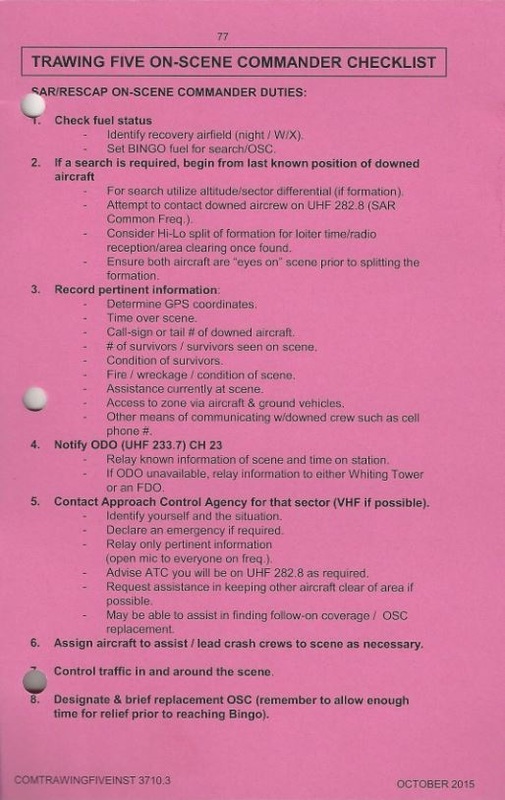 The course rules are also overlaid on the grid for not only situational awareness but also the headings and altitudes the procedures require. Other information that is included for easy reference is a radio frequency table at the top. It is contains the radio frequencies/pre-sets you will use for operations in this working area, as well as, having them placed in the logical order of how you will use them. 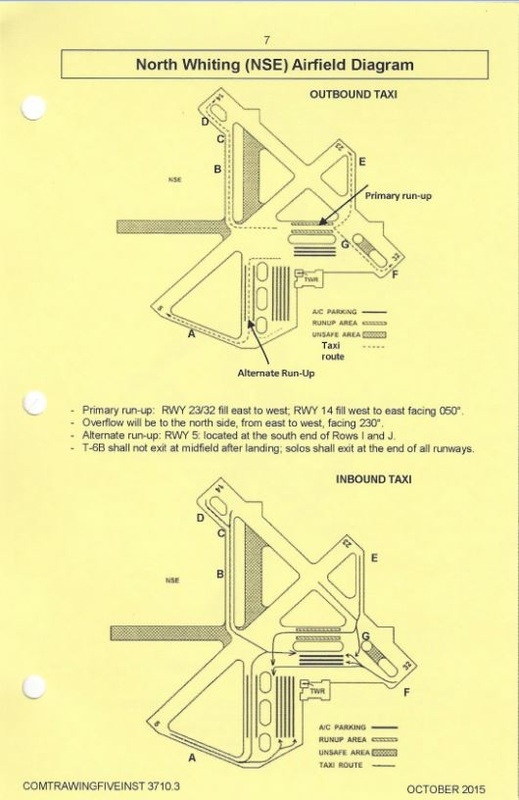 A box listing the common stereo route flight plans for the NMOA is included to remember which ones apply. Near the bottom is a box containing a breakout of the various area & transition layer altitudes. This page contains the two primary OLFs you will use when operating to the North. The page has both airfields on one page for easy reference. Pertinent information is included for each one to include frequencies, altitudes, and applicable FWOP notes. If you place this airfield page after the NMOA page, you can simply flip the page to see this information once you are leaving your working area. This page displays the working areas to the South, showing the SMOA/Area 1 areas and naming convention. It is a similar setup to the NMOA page. Within the SMOA grid, it shows the relative position of OLFs and emergency airfields with frequencies. 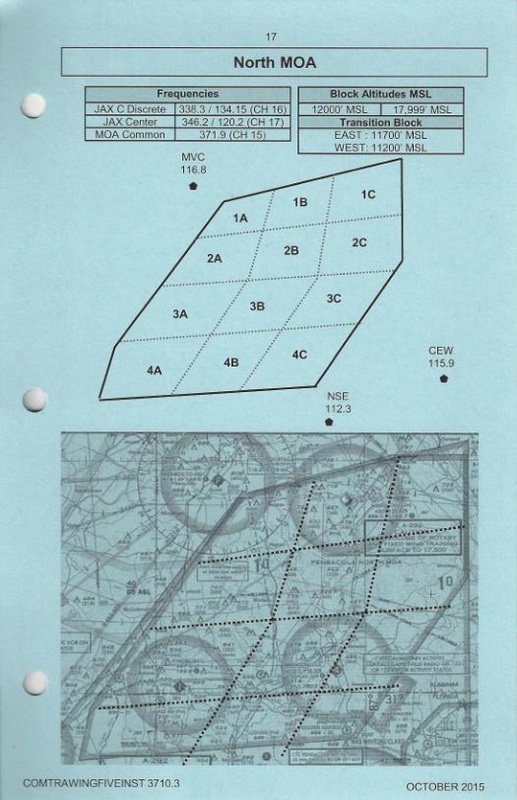 The course rules are also overlaid on the grid for not only situational awareness but also the headings and altitudes the procedures require. Other information that is included for easy reference is a radio frequency table at the top. It is contains the radio frequencies/pre-sets you will use for operations in this working area, as well as, having them placed in the logical order of how you will use them. A box listing the common stereo route flight plans for the SMOA is included to remember which ones apply. Near the bottom is a box containing a breakout of the various area & transition layer altitudes. This page contains the two primary OLFs you will use when operating to the South. The page has both airfields on one page for easy reference. Pertinent information is included for each one to include frequencies, altitudes, and applicable FWOP notes. If you place this airfield page after the SMOA page, you can simply flip the page to see this information once you are leaving your working area. 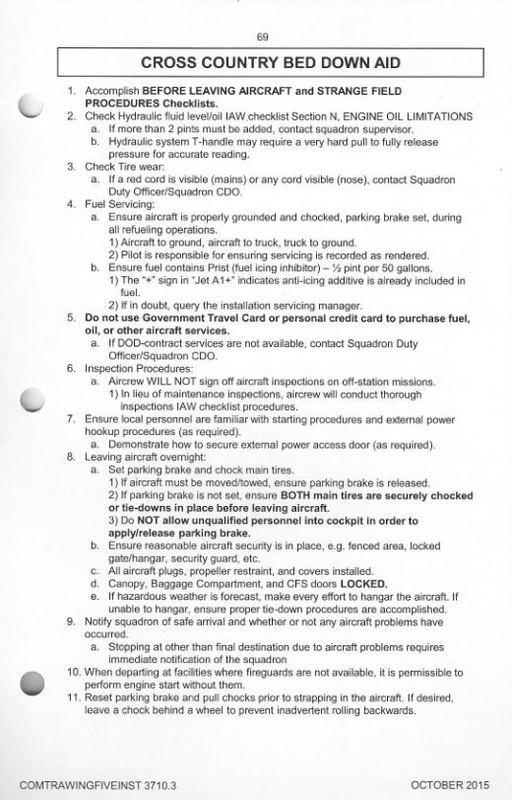 Other miscellaneous airfields that you may use (other than the primary OLF) are also incorporated as a "just in case." Some other miscellaneous pages are included for quick reference if you so desire. One page is a breakout of all of the FTI numbers for various flight parameters. Another is a diversion chart & profile based off of how much gas you have on board. And finally there is a communications grid oriented to North/West/East travel. It contains most of the relative frequencies if you had to go in the various directions but did not have the approach plate immediately available.